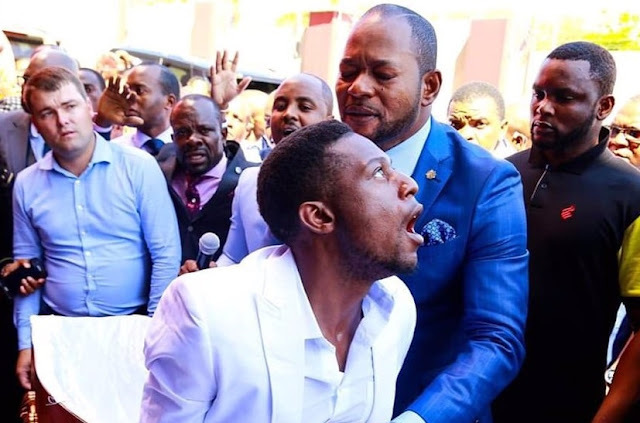 A South-Africa-based pastor Alph Lukau has been trending online since a video of him claiming to have raised a man from the dead appeared on the internet. The video which has since gone viral shows pastor Alph Lukau bringing the "dead" man back to life during a church service. The video has received lots of backlash on social media as many did not believe the man was ever dead before the pastor raised him. The controversy has inspired the #ResurrectionChallenge on social media with people sharing photos of themselves mimicking the dead man. Now, the funeral parlor whose hearse was hired for transporting the supposed corpse to the church has rubbished the claims that they are involved in the process. Kings and Queens Funeral Services is now taking legal action against pastor Alph Lukau and his church for "malicious damage" to its brand image. During the service where the man was raised, the coffin with the man's body is removed from a hearse as a crowd of people gather around it. In the video, a woman who claims to be the man's landlord, tells the pastor that the man got sick and started coughing on Friday. They took him to the hospital where he apparently died in her arms. "We did not supply the coffin, neither did we store the deceased at our mortuary and no paper work was processed by Kings and Queens Funerals. "As a funeral services provider we do not offer services without documentation, neither do we repatriate bodies without any paper work," it said in a statement. The company said it only offered funeral services, funeral cover, burials and transport and nothing else.